Comitan, Mexico has grown up over the years we have been visiting her. 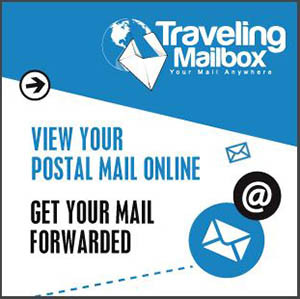 She has garnered the covetous title of Pueblo Magico due to her allure and various offerings to the residents and tourists who come to visit. Beautiful weather, a clean, family-oriented town, a remarkable Plaza, and now, upscale restaurants to compete with other international locations. The title of this restaurant and many restaurants and hotels like it who bear the same name, comes from a romantic musical tale of unrequited love. "I loved her so much, that to forget her took 19 days and 500 nights." Ungh! 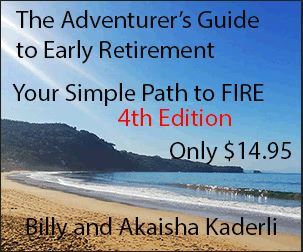 Gets you right there, doesn't it? 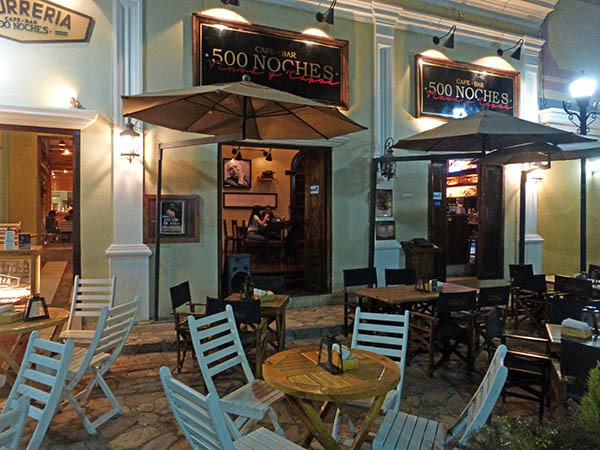 500 Noches has a full bar, a good selection of wines from around the world and various coffee drinks. Flat screen TVs offer entertainment when there isn't live music being played. 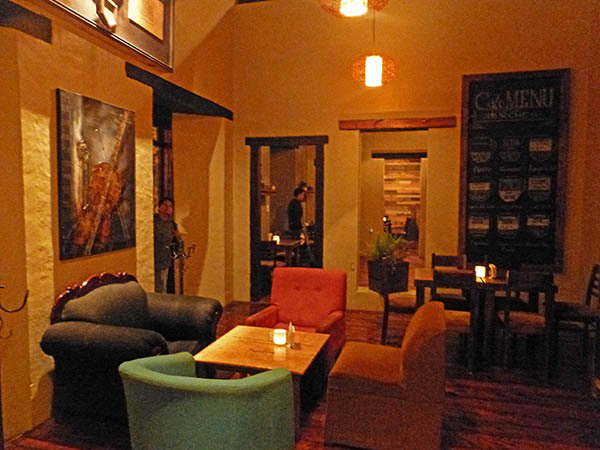 The Cafe Bar has several rooms from which to choose to meet your friends and while away the night. 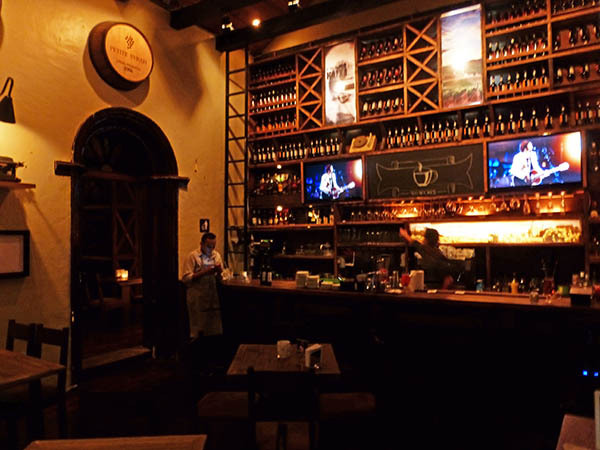 You can have a bar atmosphere or a cozy couch inside, or romantic seating with the moon and stars outside. Notice the coffee drink menu on the chalkboard on the wall. Some of the choices are pizza, stuffed croquettes, Portobello mushroom with Parmesan cheese and pesto, shrimp tempura, a terrine of potatoes, bacon and parsley, and a little stuffed ball of turkey ham with Gouda cheese and chipotle dressing. 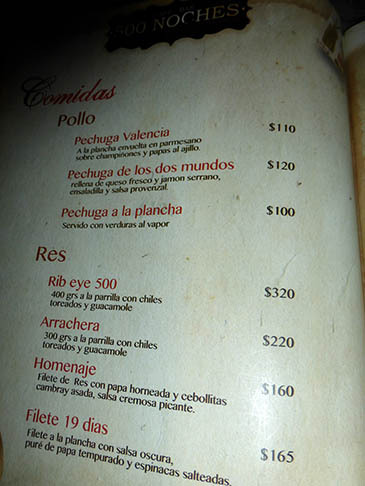 Listed are Chicken breast several different ways, Rib eye steak 500 Noches, Arrachera, and Filet mignon. Notice the Filete 19 Dias, another direct take from the song, 500 Nights. 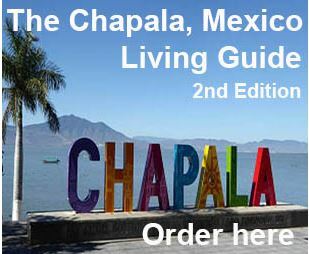 Prices run from 100-320Pesos or from $5.50 to $18USD. 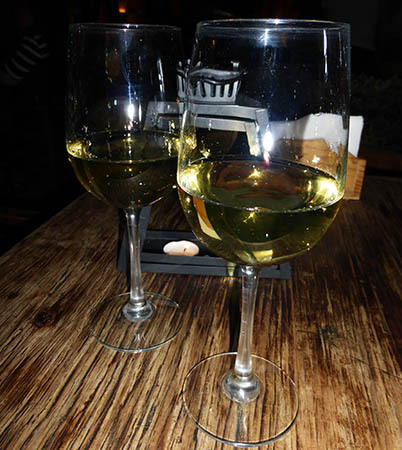 We ordered two glasses of Chardonnay at 70Pesos each (about $4USD) and decided to take our time ordering our meal. 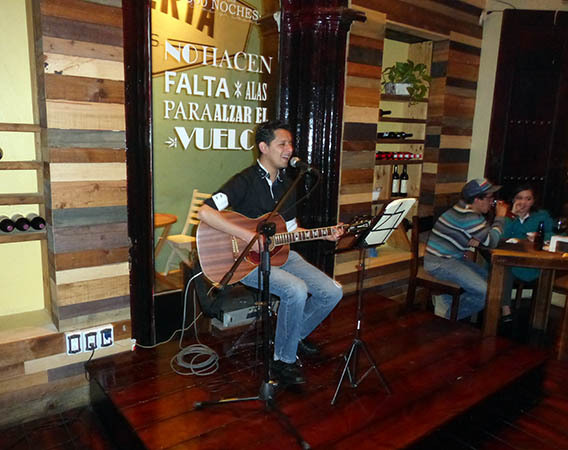 We people-watched at the Plaza and enjoyed the live music coming from 500 Noches in the background. We went for the tapas and split them. We both decided that the Portobello mushroom with Parmesan cheese and pesto was the best one; the tapas on the lower left. 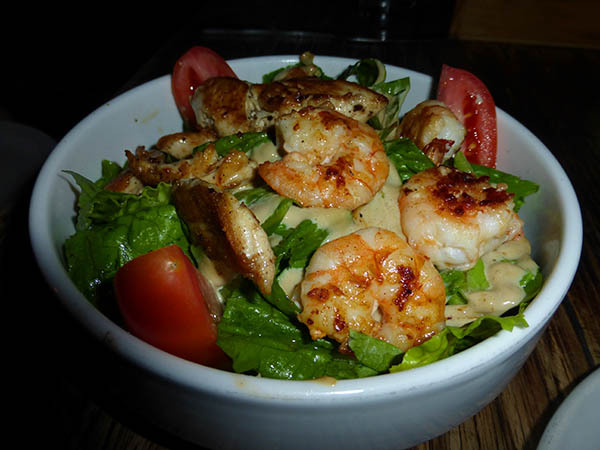 We also ordered a grilled chicken and shrimp salad with a Caesar dressing and split that as well. You can see the wonderful grilling that was done and the whole salad tasted fresh and delicious. 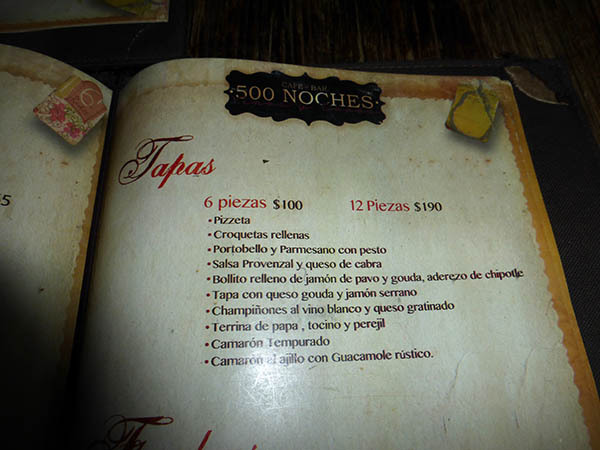 The price was 120Pesos or almost $7USD. The music was enchanting and really filled the backdrop of our dining experience. We were sitting outside on the Plaza and could hear this man's clear, eager voice through the speakers they had placed there. The sign on the mirror behind him reads: There is no need for wings to take flight. Everything is listed here on our bill, with the tip figured in for us. 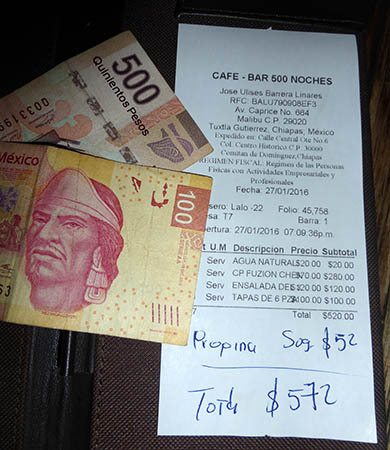 It totals 572Pesos or about $32USD. 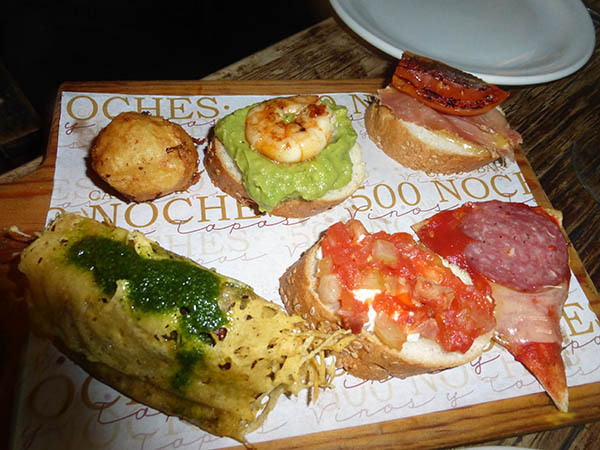 Certainly, for a romantic evening or joining with friends for conversation and delicious food, 500 Noches has much to offer. When visiting Comitan, make time to stop here.